[Stride]-Stride Step-[Choose one or more cards with the sum of their grades being 3 or greater from your hand, and discard them] Stride this card on your (VC) from face down. [ACT](VC)[1/Turn]:[Soul Blast (1) & Choose a face down card from your G zone, and turn it face up & Choose one of your rear-guards, and retire it] Until end of turn, this unit gets "[AUTO](VC)[1/Turn] Generation Break 3:[Counter Blast (2) & Choose two of your rear-guards, and retire them] At the end of the battle that this unit attacked a vanguard, you may pay the cost. 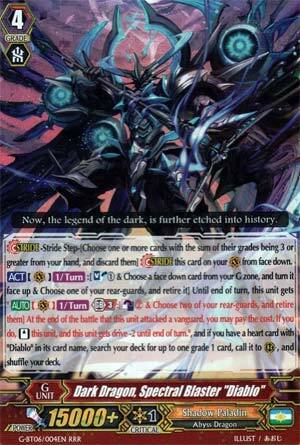 If you do, [Stand] this unit, and this unit gets drive-2 until end of turn. ", and if you have a heart card with "Diablo" in its card name, search your deck for up to one grade 1 card, call it to (RC), and shuffle your deck. R Dark Dragon, Spectral Blaster "Diablo"
Here we go, the HYPE card. Spectral Blaster Diablo is a GB2 ACT skill that requires a Soulblast 1, a flipping of one face-down G Unit, and the sacrifice of a rear-guard, but for that turn, after Spectral Blaster finishes attacking the Vanguard, you can Counterblast 2 and retire 2 rear-guards to stand him back up, at the cost of him losing two Drive Checks for the next attack. And after you've paid the cost for his ACT skill, if the heart is Diablo, you can call a Grade 1 from the deck. So not only do generic Shadow Paladin get a more reliable finisher in conjunction with Phantom Blaster Diablo, we get a card that works absolutely perfectly with the existing Diablo cards. Actively being able to search perfect sacrifice targets such as Charon 2.0 or toolbox the best field for the job is what makes this card good. Hell, I'd shoot for a bit unbalanced in Diablo decks. You still get 3 Drive Checks initially, then you pay the cost sacrificing Charon or David if it's still there, then the second attack forces a -2 at least from the opponent (Perfect Guard the minimum) and you get another Drive Check. So you just reinforced your hand by 4 cards and only needed to initially lose one rear-guard that cannot be used to guard with. Still not a 4-of given you still need 2 Aurageyser (for both of your Diablo Grade 3's GB2) and 4 Phantom Blaster should things go a bit south, but a powerful card that needs to be gotten quickly. Nanya Dark Dragon, Spectral Blaster "Diablo"
Spectral Duke Dragon, is that you? Obviously meant to help Blaster Dark "Diablo", but it comes with Vortimer "Diablo", and if you remember Spectral Duke Dragon, you remember the ride chain had Vortimer, so, yay! Anyway, what do you do, SDBD? SB1, Retire a Rear-Guard, Persona Flip and GB3, huh? So, obviously you can use this or Phantom Blaster "Diablo" as your 2nd stride. Yay for consistency! Then at GB3, CB2 and retire 2 rear guards and this gets -2 drive check and restands and with a "Diablo" heart it calls a grade 1 unit from the deck. Now, if you can't tell, that was complete sarcasm. This is meant to wear out your opponent's hand defenses and then you can finish them off with Phantom Blaster "Diablo". So, yes, get 4 and run 4. Gods this is going to be expensive, same with Vortimer.